As Professor of Typography, Wolfgang Weingart was one of the reasons why many design students came to study at the Basel School of Design. He lectured about the program all over the world and his posters became well-known throughout the design community. Mr. Weingart’s work as a teacher and visiting lecturer has not only strengthened his students as ers, but has also played a decisive role in modern typography and design. His students have now taken the opportunity to reflect on his teaching, their experiences in and out of the typeshop, the projects they created, as well as Weingart’s own work which has not only been an inspiration, but has made a significant impact on their lives as professionals. 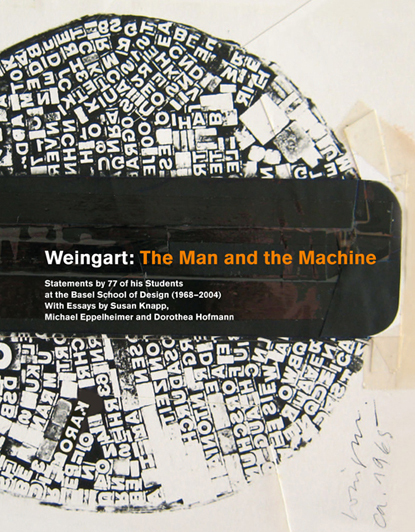 The words from Weingart’s students – many of them given endearing and often witty nicknames, which are also listed in the book – paint vivid pictures of their mentor and reflect the true dedication and respect which they continue to hold for him today. 167 x 215 mm, 96 pp., 116 black and white plates, hardcover, sewn binding and bookmark. Book design by Susan Knapp. Limited edition in English. ISBN 3-9521009-7-8. CHF 34, $34, EUR 34 (shipping not included). Although this project was made possible in part with generous support from Vitra Design Foundation, we are still in need of some further funding to cover all of the costs. Please click the Buy Now button below to order books or the Donate button to support production costs. You may pay using your PayPal account or credit card. Orders from Switzerland may be placed directly to us via email. The technology used in has changed just as much as the terminology used to describe the profession. This publication pays hommage to old school commercial art from the 1970’s and early 1980’s. Handdrawn letterforms, in combination with self-adhesive lettering tape was not an economic or aesthetic decision, but the result of having very limited possibilities to create letterforms. Patrick Lindon Industrial Design: Sweet Dreams. Seven concise statements on Moods and Interpretations in Aircraft Interiors from a designer’s perspective, including the translation of corporate identity into the third dimension, colour, light and form, human factors, tranforming dreams into reality, maintenance issues and visions for the future. Boldly illustrated with sketches, renderings, technical drawings and photographs. 11.5 x 14.8 cm, 36 pages, 18 full color and black and white plates. Limited edition. Price on request. Patrick Lindon: Aircraft Interiors – The Basics. Six concise chapters on contemporary air travel, time management, effective design for passenger comfort, teamwork and the ups and downs of production. Illustrated with drawings, renderings and photographs documenting the creative process of aircraft interiors and seating design. 115 x 148 cm, 36 pages, 22 full color and black and white plates. Limited edition. Price on request. Haus fuer Kunst Uri: Below Ground Level. Exhibition catalog edited by Sylvia Rüttimann and Monika Hardmeier, with Eva Baumann, Tiziana De Silvestro, Fischli/Weiss, Claudio Fäh, Guido Guidi, Lena Huber, Charlotte Hug, Milo Keller, William Kentridge, Marianne Kuster, Richard Ross, Hans Schubus Rudolf Steiner, Sandro Steudler. In honor of the 125th Anniversary of the Gotthard, Switzerland’s most famous tunnel, the Haus für Kunst Uri celebrates the fascination of being below ground level in an artistic sense. The catalog is an interdisciplinary reader containing ten essays from the vantage point of art historians, historians, philosophers, writers and filmmakers. Patrick Lindon: The Making of a Business Class Seat. 11.5 x 14.8 cm, 36 pp., 21 full color plates, in English, 2007, limited edition. Price on request. Peter Stohler (ed. ): Elastic Time – Depiction and Staging in Art. Time management, pressed for time, out of time – these are all terms which are prevalent in today’s modern world. So it is understandable that the topic of time appears again and again in philosophical essays, scientific investigations and popular lifestyle guidebooks. Time and its consequences are common themes also used by artists, who manipulate our perception of time. In this exhibition catalog, various generations of artists present their works to the viewer, who in turn may embrace these on one’s own recherche du temps élastique (search for elastic time). Time is stretched, totally suspended, blotted out, or even compelling one to leap into another frame of time. Exhibition catalog with short essays by Peter Stohler and Sylvia Ruettimann, with Eva Baumann, Christian Denzler, Ingo Giezendanner, Pia Gisler, San Keller, Labor, Angelo A. Luedin, Irene Maag, Nils Nova, Hildegard Spielhofer, Beat Streuli, Kris Vleeschouwer, Martina Weber as well as selected works from the Arts and Artifacts Collection of Canton Uri, ARK/Basel. Barbara Rettenmund, Susan Knapp and Liliane Steiner: Kinderstadtbuch Basel (Children's Basel Book). The Kinderstadtbuch Basel contains 100 objects in the City of Basel which are of particular interest to children and their families. There is a selection of prominant historical points of interest, such as the Mittlere Brücke (Middle Bridge), City Hall and the Basilisk (a legendary reptile reputed to be king of serpents and said to have the power to cause death with a single glance), as well as lesser known things which one stumbles across in Basel: for example Schooryyse (shoe scrapers) or Grenzmarkierungen (property markers), plus an array of fountains, monuments and hidden oddities. There are 5 suggested walking tours on which adults and children may discover together many secrets of Basel, plus a full-color map of the city. Exhibition catalog, including a forward by Dr. Henri St. Ferner, Volksdruckerei/Basel, 24 pp., in English and German, 2003. Limited edition. Out of print. Andreas Fiedler (ed. ): Really Real. Exhibition catalog, ARK/Basel, 64 pp., in German, 2003. Exhibition catalog, Grisons Museum of Fine Art/Chur, 48 pp., in German and English, 2001. Prices do not include postage and handling charges.